I ypically a bird of long grass in open country, sometimes near water, this is one of the commonest species of African finch. Small flocks feed on the ground or on standing grass, taking seeds (mainly of grasses) and sometimes small insects. • NEST An oval structure with a tubular side entrance, made of grass and lined with soft feathers or grass flowers, in a grass clump or low in a bush. • DISTRIBUTION Africa south of the Sahara. Small populations introduced elsewhere in the world. I he red rump of this grassland finch is conspicuous as it feeds among grass stems, taking seeds, insects, and soft shoots. Flocks often visit water to drink and bathe in the early afternoon. • NEST An oval nest of grass, at ground level or slightly above. Often uses old nests of other bird species. • DISTRIBUTION Africa south of the Sahara. • REMARK Also known as distribution ^— the Orange-breasted Waxbill. 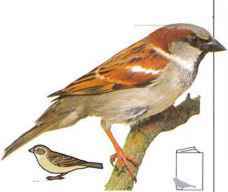 This bird has a bouncy flight and is common along forest edges, in open, grassy areas with shrubs, and even in town gardens within its range. 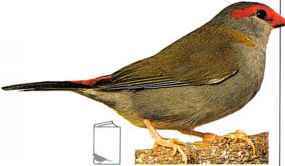 The Red-browed Finch is seen either in pairs or in small, fussy flocks, feeding among grasses and low plants and taking small seeds. 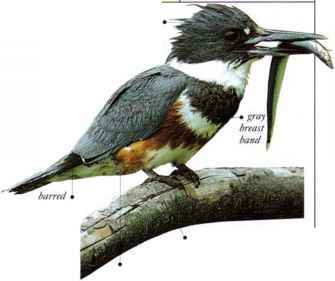 • nest a horizontal, bottle-shaped nest with an entrance tube, made of grass stems, lined and placed in a tree or bush. Introduced populations in S.W. Australia and S. Pacific (on Society distribution Islands and Marquesas Islands). 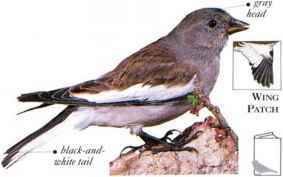 So named because of its black-and-white, barred tail, this species lives in semidesert areas near water, feeding on seeds. It is seen in lively flocks which utter short, nasal notes. • Nest a dome of grass with a side entrance, in a bush or hollow branch. E. Indonesia and much distribution of Australia. This brownish gray little finch is identified by two black bands across its breast. Small parties feed in short grass or on bare ground, always close to cover, taking small seeds. • NEST a horizontal, bottle-shaped nest made of dried grass, lined with finer grass, and placed in a small bush or in tall grass. 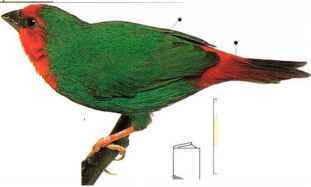 1 he red-and-green plumage of this finch can be compared with that of a parrot and has given rise to the name. This spccies occurs in farmland and open woodland. 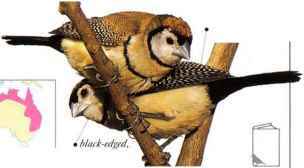 Seen in pairs in the breeding season, and in flocks at other times, it feeds on grass seeds and sometimes insects. • NEST a round nest of grass with a side entrance-, usually in a cavity or recess, or under an overhanging clump of grass. • DlSTRIBl JTION New Caledonia. 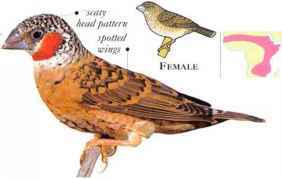 I his common African finch is typically found in tropical grassland with thornhushes and in thickets along river valleys. It feeds on seeds of grasses and other plants. Small flocks come to waterholcs regularly in the afternoons to drink and bathe. Birds are often seen perching and roosting in huddled groups. • NliST A large, untidy, domed structure made of grass heads, lined with feathers, and placed at the end of a branch in a moderately high tree. • DISTRIBUTION N.E. Africa from Sudan and Ethiopia to Tanzania. 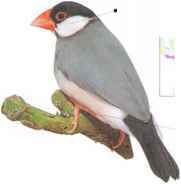 A heavily built but sleek-looking seed-eater, the Java Sparrow lives in tropical grassland and farmland. It feeds on grass seeds and cultivated cereals, and on occasional insects. Large flocks visit rice fields in the nonbreeding season. • NliST A bell-shaped, domed structure, made of woven grass, usually under the eaves of a building. • distribution Java and Bali. Introduced in the tropics worldwide. • REMARK I bis is a popular cage bird, particularly in Asia. 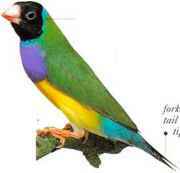 Its highly sociable nature makes it an easy bird to breed in captive conditions. Escaped populations occur in some countries. 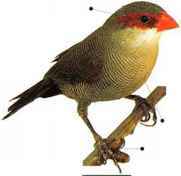 I his is a perky little finch of tropical grassland and drier woodland regions that feeds on seeds and insects. Only the adult males possess the rctl throat patch referred to in the name. Cutthroats form pairs during the breeding season and associate together in lively, chirping flocks at other times of the year. • NliST Makes a spherical nest of grass and leathers. Alternatively, it may takeover an old nest of a sparrow or weaver. • DlSTRIBl ITION Africa south of the Sahara. Few spccies of bird in the world can rival this bird for sheer splendor of color. 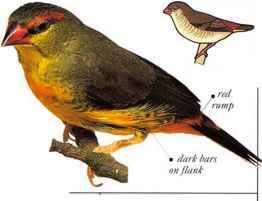 It is a seed-eater of tropical open woodland and scrub, feeding in small flocks on the ground. • NEST A loosely built dome of grass, usually in a hollow in the ground. 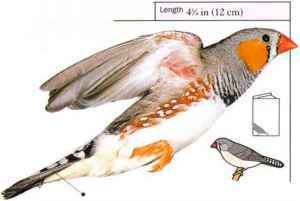 An inhabitant of extensive grasslands in the subtropics, this bird forages on the ground for fallen seeds. It does this with an unusual hopping movement, in which it scratches the ground while jumping up with both feet. Early in the breeding season, it is seen in small parties in which males outnumber females. 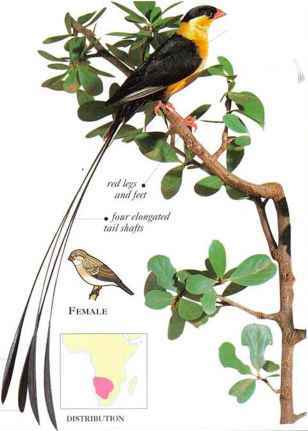 The males have long tails, which they show off in competitive songflights to attract females. 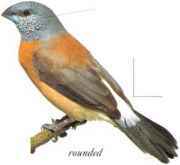 Once the males have ceased to display, the long tail is shed and a new plumage is grown resembling that of the female. When breeding is over, the birds gather and feed in large Hocks, which are seen roosting in tall trees. • NEST This bird makes no nest, but fosters out the care of its young by laying eggs, cuckoo fashion, in nests of Violet-eared Waxbills (Uraegjnthus granatiua).The young whydahs resemble young waxbills in mouth markings and in their calls, and the nestlings of both species arc-reared together by the waxbills.